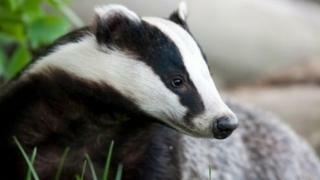 Badger culls are to be carried out in five new areas of England in a bid to control bovine TB, the BBC has learnt. Shooting of badgers will begin in early September in South Devon, North Devon, North Cornwall, West Dorset, and South Herefordshire, the BBC understands. Culling is part of the government's 25-year-strategy to eradicate the disease, but opponents say there is no evidence culling is effective. Dorset, Gloucestershire and Somerset are already practising culling. The Department for Environment, Food and Rural Affairs (Defra) would not confirm the selections had been made but said it was "currently considering applications for further badger control licences as part of the usual licensing process". However, the BBC understands that culling companies have already been selected, and marksmen trained for the new locations. Tony Francis, a farmer who had TB in his herd near Okehampton in Devon, said he had signed up to one of the new cull zones to try to prevent the disease from returning. "It's an issue which has been going on for decades," he said. "No-one has really got on top of it. I think the agricultural industry feel we've got to try and take control of it." According to Defra, England has the highest rate of bovine TB in Europe, which results in thousands of cattle being slaughtered every year. But anti-culling campaigners say there is no evidence that killing badgers is reducing the level of TB in cattle. Jenny Pike, of campaign group Devon and Cornwall Against the Badger Cull, said only 6% of TB cases in cattle came through badgers and the government should focus on curbing cattle-to-cattle transmissions. "It really is not a good use of taxpayer money, and it's going to cost thousands of badgers their lives for no benefit at all to farmers," she said. Paul Wilkinson, head of living landscapes at The Wildlife Trusts, said: "The evidence shows that badgers are not the primary culprits in the spread of TB in cattle - the primary route of infection is via cow-to-cow contact. A vaccine for cattle should be a priority. "Culling has been shown to be more expensive, less effective than other bovine TB control mechanisms and the free-shooting of badgers has been shown to be an inhumane method of killing." In March hundreds of protestors campaigned against the plans to introduce culling in Devon and a significant policing operation has been planned in case of disorder when culling begins in the new locations in September. Culling in Gloucestershire is expected to be extended, while those in west Somerset and north Dorset are due to continue, the BBC has also learnt. Has Defra shown badger culling works? Has Defra shown that badger culling stems cattle TB?